If you can't wear a bit of sparkle around Christmas time, then when can you, right? 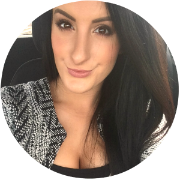 I, for one, like to add some shimmer and glitter to my eyes all year round and I have a selection of trusty favourites that I thought I'd share with you. I picked up the Marc Jacobs Twinkle Pop Eye Stick in 404 Three Shakes from Sephora, whilst in Paris a couple of months ago. It's not been in my collection long, but I'm hooked. Whilst the cutesy name may give me cringey shudders down my spine, the effect on they eyes is full of glimmering goodness. We all know how well golden tones match a classic, red lip, or any statement shade, for that matter and this antiqued-bronze is perfect. As the name suggests, it leaves the lids looking as though they are smothered in golden glitter, without the hassle of actually applying a loose version. The slanted stick is the perfect size to apply directly onto the lid, without creating a mess and the cooling formula is so smooth and creamy, that blending it out doesn't need any elbow-grease. To top it off, it stays looking perfect until you remove it. I definitely intend to pick up a few more from the collection next time I'm in Sephora! Charlotte Tilbury's Colour Chameleon Eye Shadow Pencils are actually formulated so that each, differing shade emphasizes a particular eye colour. Bronzed Garnet is supposed to be paired with green eyes to really make them stand out, but I picked it up despite my peepers being brown. I'm a rebel, what can I say? 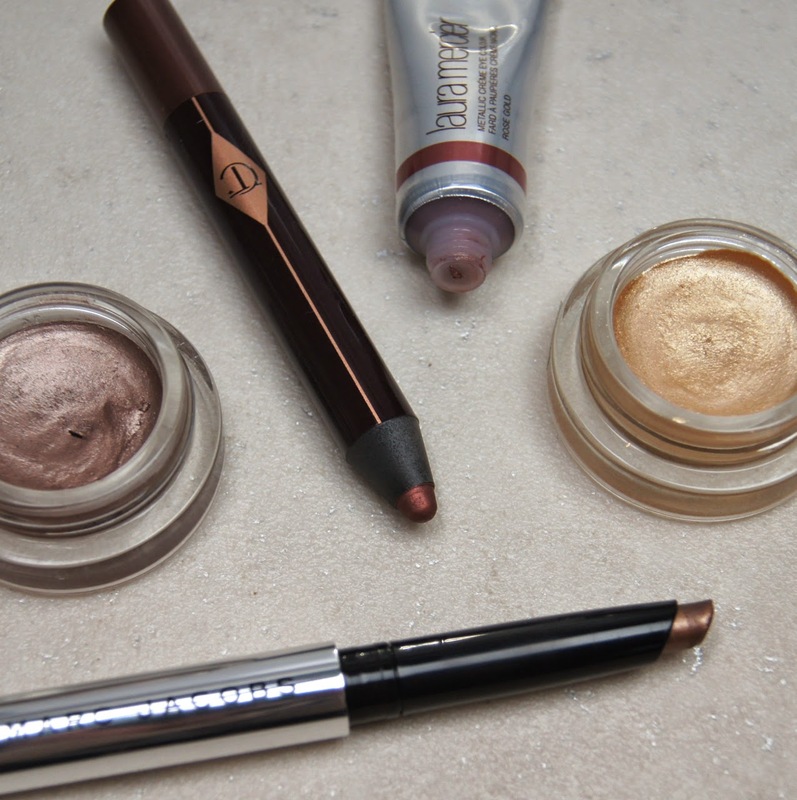 With hints of warming red and purple, this bronze is a bit more special than the average, but you need to pile on some liner with it, to avoid eyes looking red and sore. Infused with synthetic sapphire (ooo, matron! ), the golden shimmer is dazzling and it really does look as though you're wearing crushed gemstones. Once set, these waterproof shadows will not budge, making them a great option for oilier skins. No need to worry that your eyeshadow has smudged whilst your dancing the night away and sipping some festive drinks! Christmas can be costly and it's a time to spend our money on others. So, if you're after a budget option, then I love the Maybelline Color Tattoo 24hr Cream Gel Eyeshadows. A drugstore, cult-favourite, they have strong pigment which can be built up to look opaque in seconds, giving a liquid metal result. Lasting all day and night, without any creasing, they rival high-end formulas, but for a fraction of the price. Ensuring you screw the cap on tightly after each use, a pot should last for months, so they're a total bargain. 05 Eternal Gold is a pale, yellow-toned gold, which isn't given much love by bloggers, but looks incredible with a pink lip. The shade that absolutely everyone raves about, though, is 35 On & On Bronze. Being more cool-toned than regular bronzes, I think it's more of a shimmering taupe, which could be better suited to you if you have pale skin. 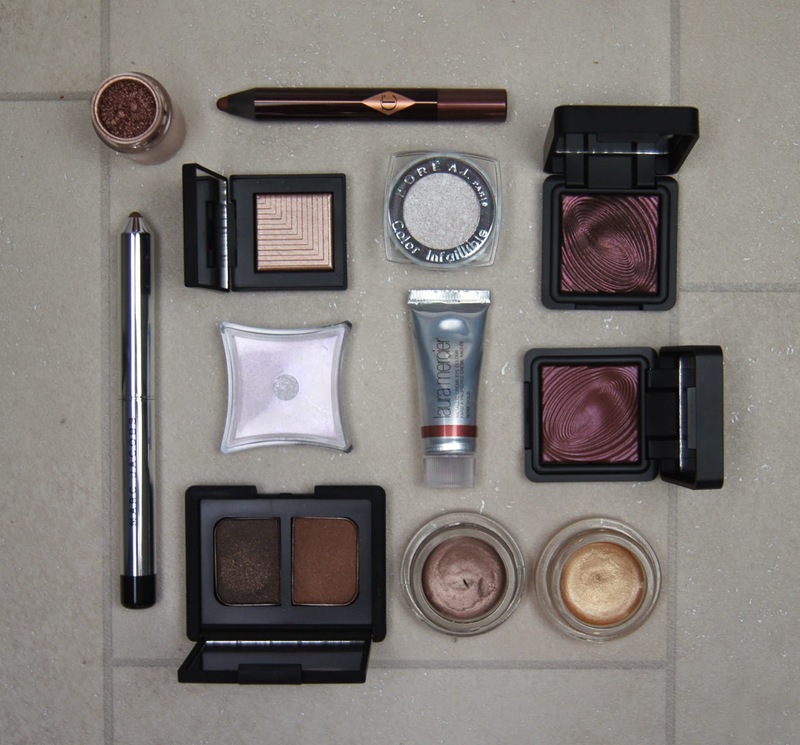 Rose gold is one of my all-time favourite colours and that, mixed with makeup, is ore-some (get it?). Laura Mercier's Metallic Creme Eye Colour in Rose Gold is one of my favourite products for special occasions and what's more special than Christmas and New Year? Compared to similar shades, this has much more rose to it, than gold. Sweeping a small dab of the light, mousse-like gel across the lid gives a sheerer wash of colour and a subtle sheen, but it can be easily layered to achieve a stronger, pink colour and foiled finish. The more you build it up, the longer it lasts. If I don't use a primer underneath this cream shadow, then it can start to crease after a few hours, but I quite like that lived-in, grunge look. The tube packaging isn't the most practical for daily use, but if you aren't rushed and have a decent amount of time to spend on your makeup, then it's fine. 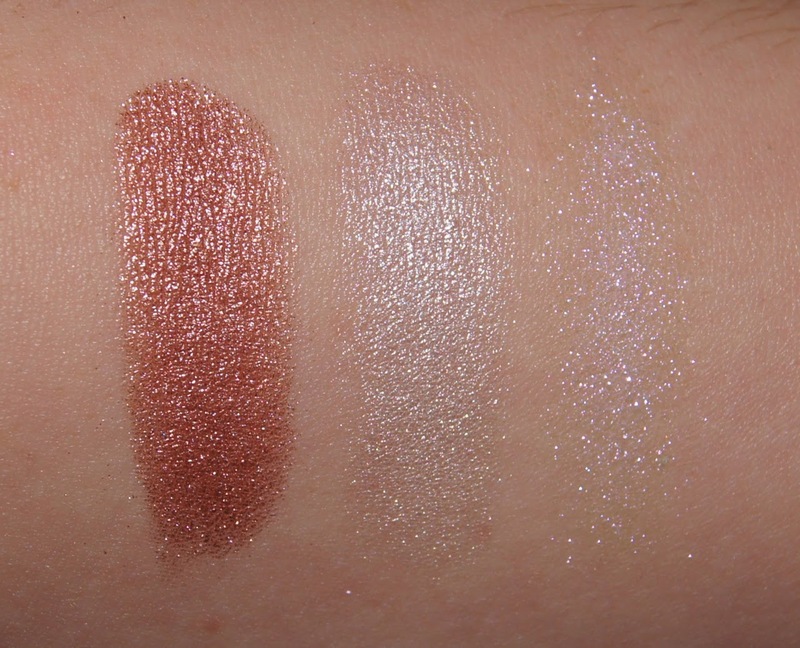 Eyeshadows that can be used both wet and dry can give you multiple looks, from the one product. 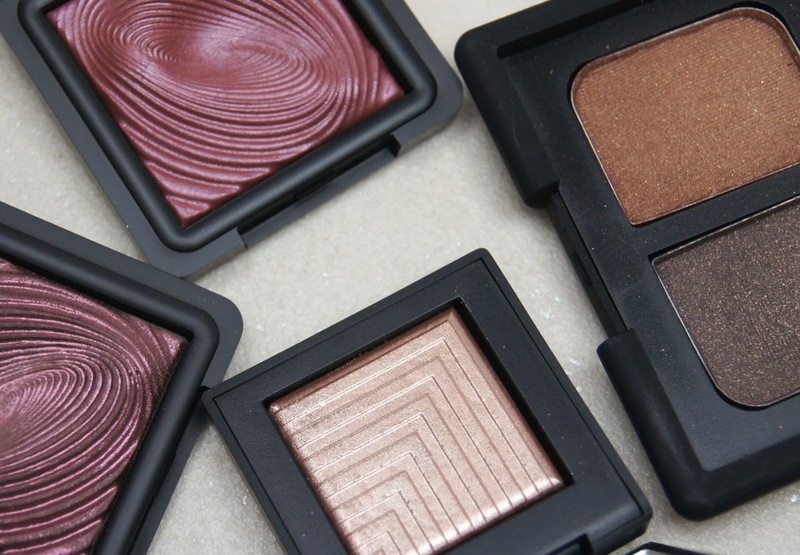 Nars' Dual-Intensity Eyeshadows give you the best of both worlds. Used alone, they have a softer, powder finish, but adding a drop of water, transforms the texture and ramps up the intensity to the likes of a cream. The trick with this type of shadow, is to wet the brush you use (I spritz mine with my Urban Decay setting spray), rather than to add water to the pan. Himalia, starts off as a shimmery, champagne beige, but turns into more of a darker, silvery topaz. The shimmer is so fine, that it has more of a subtle, pearlescent finish when dry, but looks metallic when wet. The pigment isn't too overpowing, though and if you just dab a damp brush into the pan and swirl it across the eye, then it allows your skin or base colour to still show through, which I love. Don't fret, it's still easy to get a stronger pay-off, if you add a touch more water and pick up more product. 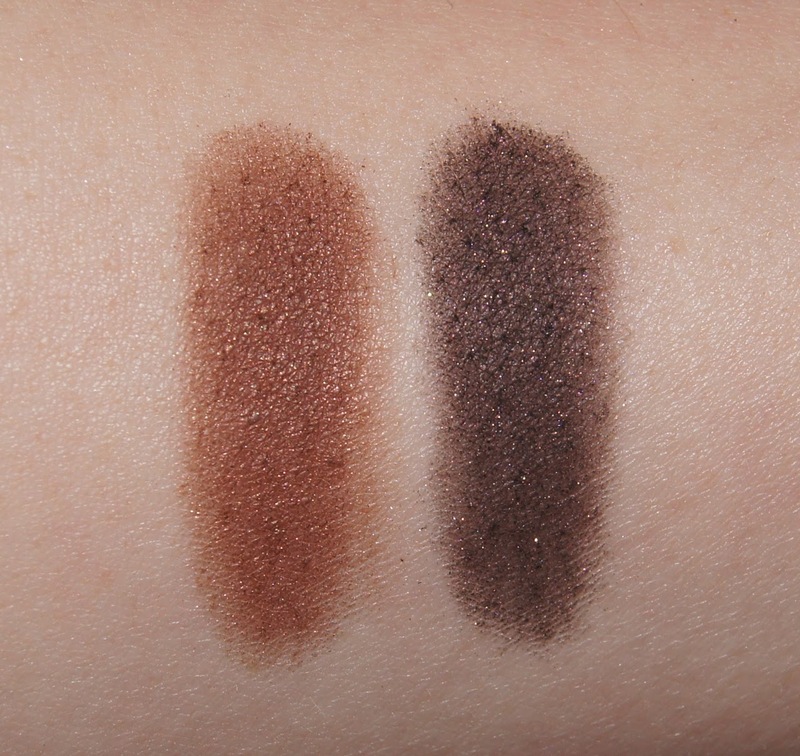 A cheaper alternative are the Kiko Water Eyeshadows, which work in exactly the same way. I tend to buy brighter eyeshadows from cheaper brands, as I don't wear them as often as neutrals and Kiko do colour cosmetics so well. You could easily be fooled into thinking that these shadows are more expensive than they are, as the quality is so impressive. Not for the faint hearted, the colour pigments are intense, even when dry, but the coverage is totally opaque when wet. 203 is a bright burgundy, with a raspberry-pink base and 204 is a dark, blackened plum. Both shades are shot through with a huge helping of shimmer, but it isn't at all chunky, which can be the downfall of other, cheaper formulas. Prefer something darker? My favourite, go-to palette for creating a bold, smokey eye is the Nars Eyeshadow Duo in Cordura. Consisting of a lighter, tarnished copper and a sooty, blackened brown, this pair gives the eyes such drama. Both shades contain a generous dose of golden shimmer, which lifts the colour and prevents that unappealing, punched-in-the-eyes look. Velvety-smooth, long-wearing and with vivid, true-to-pan colours, Nars's powder eyeshadows are some of the best (ignoring my distaste for the opaque, rubber packaging). The brand offers some unusual, exciting colour duos, but 'Cordura' is definitely one of my holy-grail, night-out must-haves. To really go all-out with shimmer, then you can't get much more sparkling than pigments. If you fancy recreating the look of snow, this Christmas, then the Loreal Color Infallible Pressed Pigment in 001 Time Resist White will be right up your street. Transitioning between a soft, opalescent oyster and a sheer, silvery white, it looks almost like water on the skin when the light catches it. If you apply it lightly on the lid, the effect isn't too frosty or tacky-looking, but I like to pack it on at the inner corner of the eye to brighten. We all know how fiddly and messy pigments can be, but this is a pressed version that creates no annoying fall-down. Genius! For something extra special, Illamasqua's Pure Pigment in Static is a duo-chrome dream. Looking like a simple, white powder (don't do drugs, kids) in the pot, you could easily overlook this shade. Once you've caught a glimpse of the flashes of fuchsia and indigo, however, you'll be mesmerized. Trust me, my swatch does it no justice! It's best to apply this sparkle before fully finishing off your base makeup, as it will inevitably drop down onto the cheeks, leaving you covered and surrounded in a cloud of glittery flecks. Layered over a cream base, the glitter is amplified and holds on for a lot longer, as it has something to grip to. 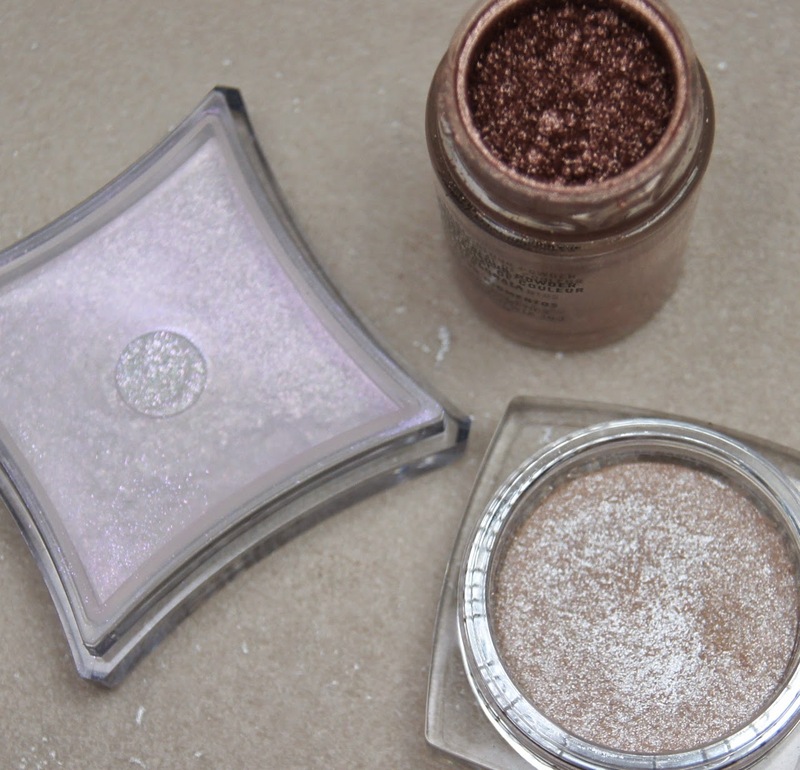 Another rose-gold shadow, this time in powder form, is MAC's Tan Pigment. Compared to the Laura Mercier Metallic Creme Shadow in Rose Gold, this is a warmer bronze that will be flattering on more skin-tones. There's no gritty, rough texture to the colour particles, as they're so finely-milled and the colour glides onto the skin effortlessly. You can either dab the powder on for a speckled effect or buff it in for a foiled finish. Cliche central, but a little goes a long way, so the tiny pot will literally last forever. Which eye products do you turn to for a party? 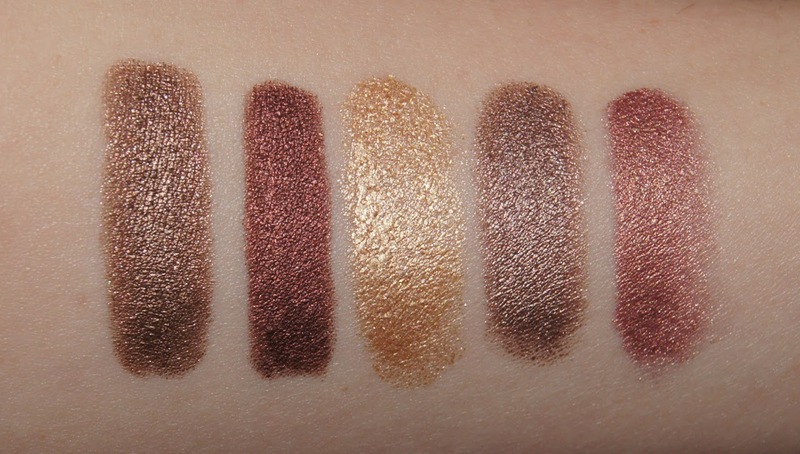 I love your swatches! For the first time in my life I'm tempted by a Charlotte Tilbury product - the eye pencil!